There have been few female solo musical artists in the past decade who come from such diverse backgrounds and have taken such a different approach to composition and genre-melding that they are almost indefinable. M.I.A., Santigold and Grimes hold slots in this very small pantheon, but it looks like with Meniyka Kiravell’s debut album, Vaudevellia! this team of unconventional artists may have found another. Kiravell takes her many inspirations not only from music but nature, travel and most of all, life. Born and raised outside of Detroit, Michigan, Kiravell attended The University of Michigan at Ann Arbor. It was at school where she found her love of music, playing in a number of indie bands and working as a radio DJ. the would-be singer began travelling extensively after school. She names her travel as just as powerful an influence over the way she shapes her music as her actual training. Kiravell travelled to over 40 countries over the last decade with the intention of settling in Australia when her mother developed severe migraine pain. Having learned healing techniques during her travels, she decided to return stateside to help her mother. These experiences with her family touched the singer’s heart and after finally settling in San Diego she decided to write down all her experiences and feelings and set them to music. The result is the diverse, heartfelt and very original Vaudevellia! The first five tracks of Vaudevellia! were released in stages on SoundCloud, each with its own album art designed or painted by the artist herself. The album released in full today, July 27 and features both an instrumental version and a full vocal version of each track. Largely jazz-based, this unconventional artist’s sound goes every which way from there. The opening track to Vaudevellia!, Pache Mama, starts with a rather conventional jazz piano, but then suddenly Kiravell’s voice comes on with a surprising rap/spoken word verse. The song has a sort of stop/start sort of structure, and from the verse the song then abruptly goes to a bossa nova jazz flavor with no vocals. These two pieces toggle back and forth once or twice before the bossa nova takes over for the rest of the song, with the spoken word re-added towards the end but this time it coincides with the beat. The very next song, Charge, has a similar piano melody but is more within a standard jazz fitting. The lyrics are sung here, and have a dreamy and a dissonant quality which will most definitely become something Kiravell is known for in her music just as much as her bare bones approach to the piano and her unconventional song composition. Beyond those two characteristic bits, she is very free in the way she puts her music together. Delta, another highlight, begins with a sort of doo-wop opening before moving into more conventional jazz. The album ends with Wash, a song which has a similar feel and structure to Charge, and it is possible that the two are linked, as the lyrics of Wash seem to be a continuation of and new beginning after the excitement of Charge. The subject matter of Kiravell’s lyrics is also surprising. 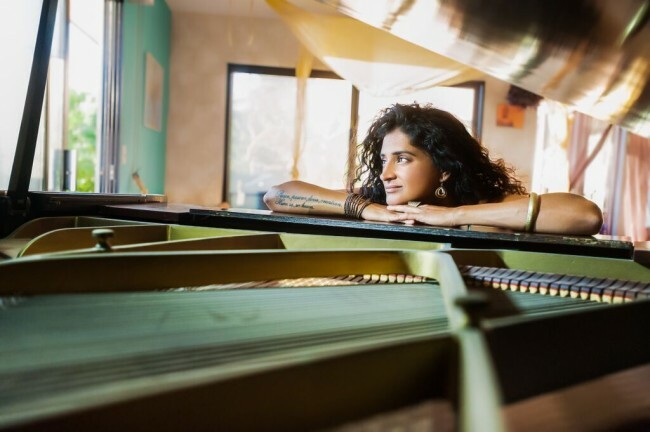 With all the travel and life experience the singer has under her belt, the expectation might be that her lyrical compositions are of a storytelling nature, describing experiences and trips in detail. Not necessarily, on the contrary, her lyrics are more esoteric and general but also highly relatable, as though she is telling a story but from a mile-high perspective. These lyrics can be about anyone and no one, but they still describe feelings and experiences in a very real way. When listening to Kiravell’s Vaudevellia! one gets the sense that all of her experience and influences have at times served to confuse and dazzle, to create a wacky multicultural and multi-genre show which she is now transferring to music. Frenetic and diverse, Kiravell showcases all these different elements of music and indeed of life in a way that does not ignore but highlights and celebrates the interconnectedness of all these things and of the facets of life itself. Style-wise, she may seem unconventional and a little odd, but like Santigold or Regina Spektor before her, this kooky take on jazz, indie rock and rap will earn Kiravell a spot among the very few truly original female musical artists of this decade. Image provided courtesy of Kiravell’s media kit. One Response to "Kiravell’s ‘Vaudevellia!’ So Different, Almost Indefinable [Review]"